A prominent Babylonian Talmudist of the eighth century. He enjoys the distinction of being the first rabbinical author known to history after the close of the Talmud.The gaon of Pumbedita having died, Aḥa was universally acknowledged to be the fittest man to succeed him. But a personal grudge entertained by the exilarch Solomon bar Ḥasdai induced the latter to pass over Aḥa, and to appoint Naṭronai, Aḥa's secretary, a man considerably his inferior in learning and general acquirements. Highly incensed at this slight, the eminent scholar left Babylonia and settled in Palestine, about 752-753, where he remained until his death. Notwithstanding Steinschneider ("Cat. Bodl." s.v. ), who erroneously assigns 761 as the year, the exact date of his demise is unknown. It must have been in Palestine that Aḥa wrote his book entitled ("Quæstiones" in the sense of disquisitions), as the title evinces; for this Aramaic word is employed in the sense of quœstio (the scientific investigation of a matter) by Palestinians only (Shab. 30a). "Sheilta" is of Palestinian origin, as is shown by the words buẓina and bisha, which accompany it. S. Mendelsohn is quite correct in his explanation of the term ("Rev. Ét. Juives," xxxii. 56). If, therefore, Simon Kahira made use of the "Sheiltot" in his Halakot, as is now certain, the statement of Abraham ibn Daud (according to whom Simon's work was completed in 750) must be erroneous, since Aḥa did not leave Palestine before 752; and we know that Samuel Gaon, whose successor he was to have become, did not die before 751-752. There are also other evidences of Palestinian influence in Aḥa's work. For example, his treatise indicates that besides the Babylonian Talmud (which, in the nature of things, was his chief authority) he made frequent use of the Yerushalmi, and of Palestinian Midrashim, Leviticus Rabbah, Ecclesiastes Rabbah, and Tanḥuma, all of which at this time were quite unknown in Babylonia (indeed, even Saadia Gaon, almost two hundred years later, knew comparatively little of them). The whole character of the "Sheiltot" is Palestinian; and, as such, they are quite distinct from the contemporary synopses of Judah Gaon and Simon Kahira, which confine themselves to important decisions of the Talmud, with the omission of all discussions, and with the addition of short elucidations of words. Aḥa's method is quite different from that of the Babylonian rabbis, who, caring little for the instruction of the common people, wrote scholastically. The "Sheiltot," on the contrary, were written for thoughtful laymen. 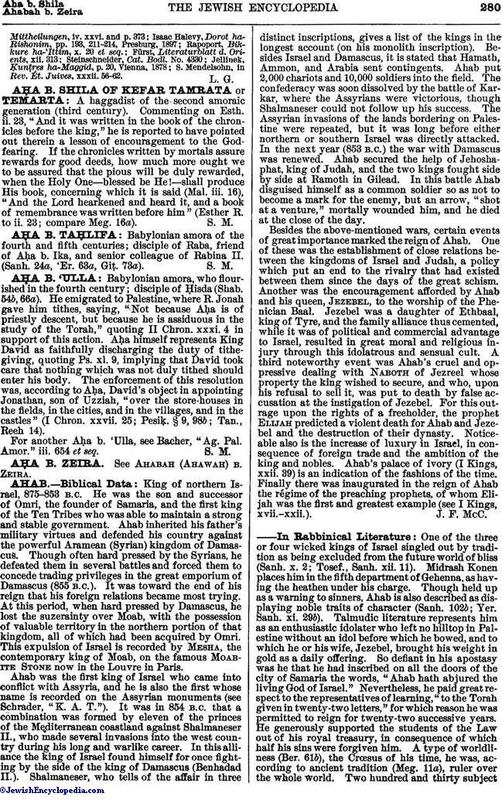 Aḥa's treatises upon Biblical and rabbinical precepts, numbering 190 or 191 (see Mendelsohn, l.c. 59), with additions from later writers, were written with special reference to the practise of such moral duties as benevolence, love, respect for parents, and love of truth. They are based upon the order of the parashot, the weekly readings from the Law. This illustration serves to show that the work is not intended for scholars alone, but also for popular instruction; and that the statement, so often repeated since the time of Meiri, that the "Sheiltot" was a book merely for the instruction of youth, is also baseless. 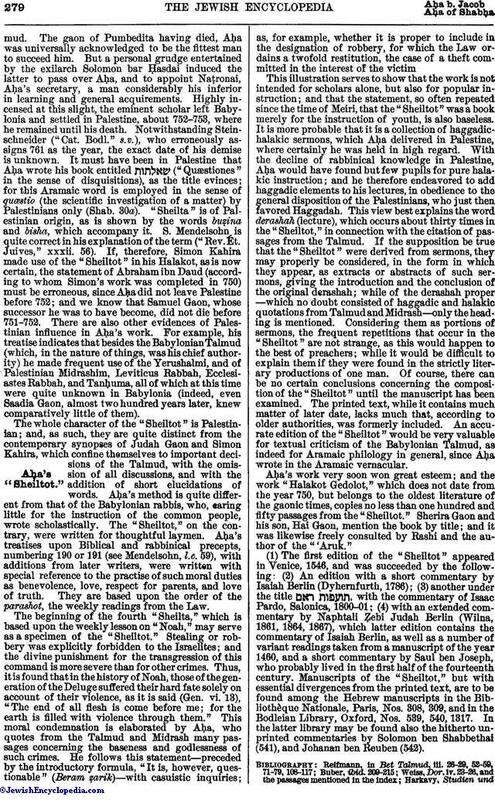 It is more probable that it is a collection of haggadic-halakic sermons, which Aḥa delivered in Palestine, where certainly he was held in high regard. With the decline of rabbinical knowledge in Palestine, Aḥa would have found but few pupils for pure halakic instruction; and he therefore endeavored to add haggadic elements to his lectures, in obedience to the general disposition of the Palestinians, who just then favored Haggadah. This view best explains the word derashah (lecture), which occurs about thirty times in the "Sheiltot," in connection with the citation of passages from the Talmud. 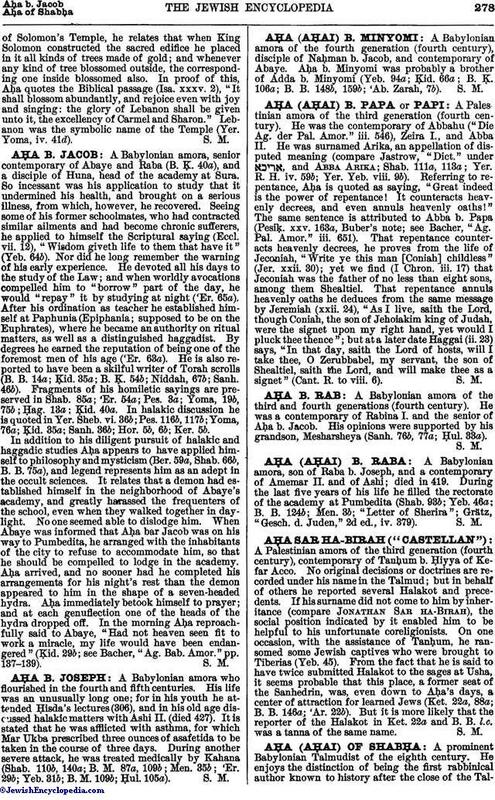 If the supposition be true that the "Sheiltot" were derived from sermons, they may properly be considered, in the form in which they appear, as extracts or abstracts of such sermons, giving the introduction and the conclusion of the original derashah; while of the derashah proper —which no doubt consisted of haggadic and halakic quotations from Talmud and Midrash—only the heading is mentioned. Considering them as portions of sermons, the frequent repetitions that occur in the "Sheiltot" are not strange, as this would happen to the best of preachers; while it would be difficult to explain them if they were found in the strictly literary productions of one man. Of course, there can be no certain conclusions concerning the composition of the "Sheiltot" until the manuscript has been examined. The printed text, while it contains much matter of later date, lacks much that, according to older authorities, was formerly included. An accurate edition of the "Sheiltot" would be very valuable for textual criticism of the Babylonian Talmud, as indeed for Aramaic philology in general, since Aḥa wrote in the Aramaic vernacular. Aḥa's work very soon won great esteem; and the work "Halakot Gedolot," which does not date from the year 750, but belongs to the oldest literature of the gaonic times, copies no less than one hundred and fifty passages from the "Sheiltot." Sherira Gaon and his son, Hai Gaon, mention the book by title; and it was likewise freely consulted by Rashi and the author of the "'Aruk." (1) The first edition of the "Sheiltot" appeared in Venice, 1546, and was succeeded by the following: (2) An edition with a short commentary by Isaiah Berlin (Dyhernfurth, 1786); (3) another under the title , with the commentary of Isaac Pardo, Salonica, 1800-01; (4) with an extended commentary by Naphtali Ẓebi Judah Berlin (Wilna, 1861, 1864, 1867), which latter edition contains the commentary of Isaiah Berlin, as well as a number of variant readings taken from a manuscript of the year 1460, and a short commentary by Saul ben Joseph, who probably lived in the first half of the fourteenth century. Manuscripts of the "Sheiltot," but with essential divergences from the printed text, are to be found among the Hebrew manuscripts in the Bibliothèque Nationale, Paris, Nos. 308, 309, and in the Bodleian Library, Oxford, Nos. 539, 540, 1317. In the latter library may be found also the hitherto unprinted commentaries by Solomon ben Shabbethai (541), and Johanan ben Reuben (542). S. Mendelsohn, in Rev. Ét. Juives, xxxii. 56-62.